More Great Pages to Have Fun! Bonnie's Print Out & Color Pages. Lots, lots of pages to color. Many things to do here. Send a T-Rex card to someone. So Cool! Boy is this a fun place. Check it out. It you like Beanie Babies, you have come to the right place. There is a playground and plenty things to do here. Play to Learn with Blue's Clues. You can see Egyptian Mummies, Dinosaurs, more. So neat, travel the stars. This page made by J-Nor. Great stories to read, wonderful graphics. Hi, It's me Ethan! Welcome to my 2nd page! My first page was getting to slow with all the graphics and links. I decided to make another page with more links, less graphics. Hope you enjoy some of the places I play.. 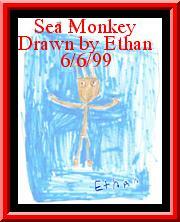 This is the picture of one of my Sea Monkeys. My grandma bought the kit for me. I just can't figure out why they do not look like the picture on the box. She said maybe one day they may look like the picture I drew. Like my picture? You can learn about all kinds of animals. I love Halloween. Games, playground here. Halloween Graphics to look at or print out.